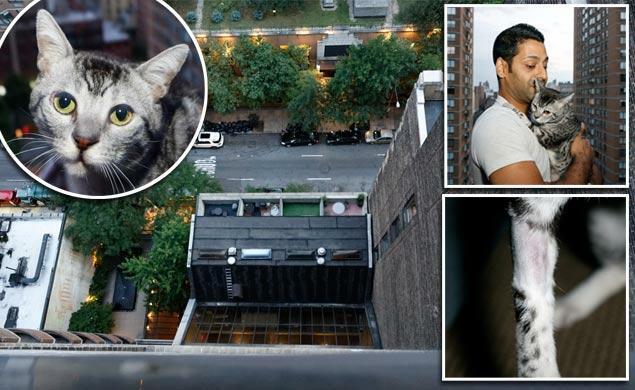 A cat named Gizmo has only minor injuries after a 12-story fall at a Manhattan apartment building. Owner Samuel Jacobs says Gizmo fell off his penthouse terrace on Tuesday. He crashed onto a third-floor landing and became wedged between a skylight and a wall. Jacobs says he didn’t see Gizmo slip through the door to the terrace — but that’s what must have happened. He had to climb out a neighbor’s window to rescue his cat. Jacobs says the gray and black cat was “freaked out.” He rushed his pet to a vet, fearing massive internal injuries.